Fractal Design is no stranger to the case market – it’s been in a well-deserved spot in the top-tier of case manufacturers. The company is well-known for its minimalistic aesthetics, versatility, quality, and above all, silence. The Define R4 was an incredible case – what is different in the Define R5? Follow me, I will show you! We here at Techgage have followed Fractal Design for a while – our very own Ryan Perry reviewed this case’s predecessor, the Define R4, and you can read that review here. Fractal Design is a Scandinavian company and its company design philosophy has always been based on the principles of clean and elegant design, with a strong focus on good build quality. While the company’s design philosophy revolves around elegance and clean styling, its marketing people emphasize a whole other facet of its products: their silent operation. Fractal Design has gone to great lengths to make the subject of this review, the Define R5, as quiet as possible; it has added sound-deadening material where it can, and introduced a new fan design that reduces noise and vibration. Enough about the specs and features, lets take a look under the bonnet and see what this case is made of! When looking at this case from a distance, right off the bat, you will notice how low-key its looks are. It is sleek, simple, elegant. Some people may not care for this; it really depends on your taste. I, for one, am tired of the wicked-looking cases, with complicated lines, lights all over the place, and just odd details. I would like to think that I have gotten rid of my attraction for all of these attention-grabbing aesthetics out of my system (heh, probably not!). As I get older and the further that I progress into this hobby/life, though, I find that I really want to focus less on what I can do to make my case stand out, and more on what I can do with my case to improve my setup, with things that matter – not lights and giant goofy-looking fans. Back to the looks of this case – less is more is the philosophy of this Scandinavian company, and with the R5 it has delivered in spades. One thing I have always had mixed feelings about is doors on cases. I worry about them impeding airflow, and they always seem to open on the wrong side, with the hinge on the left. For me personally, this has always been a hindrance. Fractal Design has a really great design with the R5’s door – for one, it looks great, like a solid slab of brushed aluminum. The door is actually plastic, but you would never know it to look at it. Good job, Fractal Design. The front of the case sports ½”-wide louvers that run the height of the case on both sides, giving the R5’s fans plenty of surface area from which to draw air to keep your case cool. So many other cases don’t give you enough surface area, and the fans end up stalling, when they could be bringing in so much more air. On the front part of the top, you see the microphone and headphone jacks, a reset button, a blue LED power light with integrated HDD activity light, and a power button, all handsomely styled. Then we find the USB ports; not only do you get two USB 2.0 ports, you also get two USB 3.0 ports as well. Here we find yet another example of Fractal Design putting thought into its design: the ports are generously spaced apart. In this day of diverse thumb drives, some being robust enough to be run over by a car, or some even shaped like Yoda (you know you want one! ), it can be frustrating to not be able to have two devices plugged in at the same time because the USB ports are stacked too close. On the roof we find threee removable top panels. These can be removed to allow fan installation, or even a monster triple-radiator setup of up to 420mm in size! Now is a good place in the review to mention that the Define R5 has diverse water cooling options available to the user. You can mount a myriad configurations, even triple radiators up to 420mm long on the roof. The front can take radiators (up to 360mm), and the floor can as well. It should also be mentioned that the Define R5 can mount fans in the same positions as radiators can. Speaking of fans, here we can see the new fan design, with the grooves cut in the fan blade, promising noise and vibration reduction. Opening the front door reveals more clean designing: we find two removable 5.25″ drive bays and the fan cover louvers, which have filters to help keep dust from entering the case. Behind the louvers are two fan mounts. With the door open, you can also access the bottom dust filter which runs the length and width of the case – airflow should never be an issue in this case! The inside of the door you can see sound-deadening material. With the side panels removed, we find more sound-deadening material. 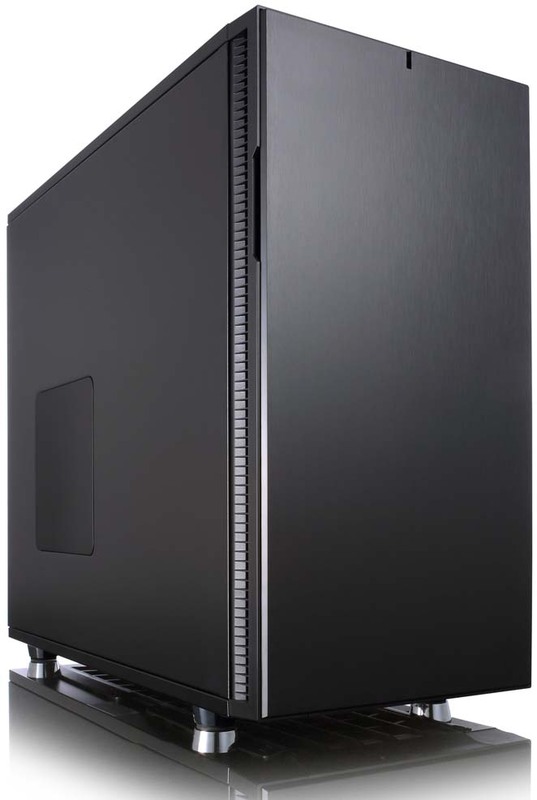 This case is available with or without a window; our review sample is the windowed version. The window is large enough to where it will show off your motherboard but not your mess of hard drives. In other words, I think the window is sized perfectly. On the right you can see the array of 3.5″ drive trays, all colored white. This would be a great setup for someone wanting to build a RAID array with MDADM, or maybe even a NAS using FreeNAS. The possibilities are really limited by your own imagination as you can easily accommodate up to eight drives very easily, and with the front fans being right there, you can rest easy knowing those drives will be kept plenty cool! Just north of the hard drives we find the two removable optical drive trays. While optical media use is in decline, it’s good to see Fractal Design still gives you the option to use optical drives, or eschew their use completely. One fantastic feature of this case that you can see all over the place bordering the motherboard cavity is the myriad slots for cable management. You can rest assured that your cables will be well-protected as they pass through, as Fractal Design spared no expense in using high-quality rubber grommets to cover the slots. They are large and plentiful – I found that I had to make zero sacrifices in how I routed my cables. One feature that has been added that makes installing the motherboard easier is the one standoff/alignment pin that Fractal Design installed on the middle of the motherboard tray. This makes placing the motherboard and screwing it down a lot easier. Over to the other side of the case we find even more sound-deadening material on the right side panel. We also find integrated cable ties made of modern Velcro. These are a cable management maven’s dream! The cutout for the CPU cooler is very large, keeping your options wide open to whatever you want to install. On the right side is where we also find the dedicated SSD mounts. I absolutely love them – they let me put my SSD back there, out of the way, nice and clean-looking. On the bottom of the case we find four large and very premium feet. They have a large contact area with a very good non-skid rubber attached. Here is also where we find a large, filtered air inlet that runs the entire length of the case. This case allows ATX power supplies up to 190/170 mm with a bottom 120/140mm fan installed. When not using any bottom fan, power supplies up to 300mm can be used. GPUs up to 310mm in length can be used with the top HDD cage installed, and up to 440mm in length with that cage removed. The GTX970 is a pretty large card, and it fit in this case with no trouble whatsoever. It would have fit even with the HDD cage installed. Thanks to the locating pin that I mentioned before, mounting this motherboard was really easy. Mounting in other stuff was really pretty standard, but I have to say that I really do like having that SSD mount in the back – since I have a NAS, I really only need to have one hard drive installed inside my tower, so it is nice to have it in the back and out of the way, allowing me to install the radiator for my liquid cooling setup in the front, as I really wanted to leave the top closed. As you can see from the pictures, my coolant hoses are twisted, but this particular kit was just about maxed out on hose length, and this was the best that I could do. Had I mounted the radiator in the top, I could have had the hoses a little neater. This, of course, does not impact performance or longevity whatsoever. While I’m not particularly obsessive about cable management, the Define R5 makes that task super easy. It helps you out in this task on both sides of the motherboard tray. The grommet-covered cable management slots on the front side are well-located. On the other side, the trough they provide is REALLY wide (20-35mm), allowing you to comfortably tuck thick cable bundles, such as your main motherboard power away, neatly and safely. The Velcro straps also help immensely in keeping those cables from becoming a wild and woolly mess. Last comment will be about the retention system for the side panels. It seems to be one of the only places on this case where the thumb screws are not captive – even the HDD cages thumb screws are captive, but not the side panel. I think this was an oversight, as this is a pretty obvious place where you would want screws to be captive as this will likely be the most removed part of the computer. Instead, Fractal Design uses a latch. I was afraid that it wouldn’t secure the side panels tightly enough, which would then mean noise from vibrations. The latch is a tight and snug closure, and the door is just as tight as if you did use the screws. Good job, Fractal Design! Normally here at Techgage, cases are temperature-tested with previous setups and compared in other cases. With this particular build not being comparable to what I had before, what with the addition of liquid cooling and all, there wasn’t a real metric for me to compare against. I will say that this case moves a lot of air, and all of my components are staying plenty cool, even when benchmarking my rig using FutureMark and just working this computer to death. Everything stayed cool and quiet thanks to this case. Even with temps rising and fans really winding up, I was really impressed with how quiet this case was. This is really a well-designed, well-engineered, and well-executed case. I could not be happier. I find it easy to write about things that I really like – like this case. It’s clear that the Define R5 is a superbly-designed chassis. It offers so much for the money – it is very competitively priced at around $130 depending on where you shop. I really cannot say anything bad about this case – as much as I looked for something negative about it, I just could not find any reason to knock it. I love its styling, I love how solidly it is built. The good people at Fractal Design have really put their best foot forward and it shows.